For three quarters, Haylee Thompson made sure her Wood River Wolverines would win their nonconference game against the Kimberly Bulldogs Tuesday night in Hailey. She was unstoppable in the paint. And late in the fourth quarter when the 'Dogs mounted a furious rally that brought their 15-point deficit down to two, 6-1 senior post Thompson came up with a clutch play to make sure that Wood River wouldn't lose. With her team clinging to a 38-36 lead with 13 seconds left, Thompson rebounded a missed Wood River free throw and spun around in the same motion for a left-handed putback that gave the Wolverines a 40-36 cushion. And that was the final score of a nerve-wracking finish for Wolverine fans. Thompson's final bucket that assured Wood River's fourth consecutive victory gave her a career-best 26 points—8 in the first quarter, 10 in the second, 2 in the third and 6 in the fourth. She added nine rebounds and two blocked shots. So, Thompson (17.3 ppg) accounted for 26 of the 40 points. She has now scored in double figures in 26 of the last 31 Wood River games and with 525 points in 55 games (9.5 ppg) has moved into ninth place on the all-time career scoring list. But it was Wood River's team defense led by the intimidating presence of Thompson and 6-0 senior post Cheyenne Swanson (7 points, 4 rebounds, 2 assists, 1 block) in the paint that helped build the 33-18 Wolverine lead after three periods. "Outstanding defense in the second and third quarters provided the girls with the win," said assistant coach J.C. Nemecek. Wood River didn't yield a Kimberly field goal for nearly 13 minutes from late in the first quarter through the third. However, when Kimberly applied full-court pressure in the fourth quarter and got some help when the officials hardly issued any fouls against the pesky Bulldog defenders, Wood River's turnovers piled up and helped Kimberly storm back. 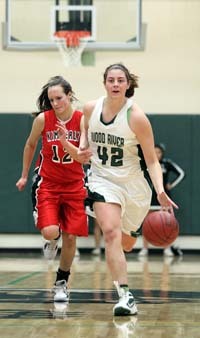 Wood River made 10 of its 27 turnovers in the fourth period when Kimberly outscored the home team by an 18-7 margin. Fortunately Thompson scored all three Hailey field goals and yanked down four big boards in the final eight minutes. The Utah State-bound Thompson took a pass from senior Cookie Benson (2 points, 5 rebounds, 2 steals) and scored close to the basket for a 35-22 lead with five minutes left. But Kimberly came back with an 11-1 run making the score 36-33 with only a minute remaining. During the Bulldog run, Wood River lost two of its best defenders—senior Lucy Paisley (2 points) to five personal fouls, and junior guard Hannah Belloli (5 rebounds, 2 steals) to what was immediately believed to be a hyper-extended knee. At that point, after a Wolverine time out, freshman guard Ciceley Peavey (1 point, 4 boards, 4 assists) inbounded to Thompson, who drilled a 17-footer for a 38-33 lead. At the other end, Wood River couldn't hold onto a defensive rebound and 'Dogs senior Halie Wilsey (9 points) banked a 3-pointer. With Wood River leading 38-36 and Kimberly attacking, Benson made an important steal with 1:01 left. It enabled the Wolverines to patiently work the ball around and wait for the 'Dogs to foul. Amazingly, the officials whistled Kimberly for only its sixth foul of the half with 25 seconds left, a non-shooting infraction. Kimberly senior Allison Cornie fouled Swanson with 13 seconds remaining and one of Wood River's best free throw shooters missed the front end of the one-and-one situation. That's when Thompson flashed across the paint, grabbed the rebound and put it back, 40-36. Other Hailey contributors were Haillie Taylor (2 steals, 4 assists, 1 block), Rory Cole (2 points) and Emmalie Dion (2 rebounds). Kaitlyn Goetz (10 points) topped Kimberly (3-5). Wood River (4-3, 2-1 league) visited the Minico Spartans (5-4, 0-2) in Rupert Thursday for a Great Basin Conference game. It's off to eastern Idaho on Saturday, Dec. 17 for a 2 p.m. matinee clash against one of Idaho's top 4A squads, Rigby. Rigby's Trojans (6-2) lost 54-44 Tuesday night to No. 2 Bonneville of Idaho Falls (8-1) in a clash of 4A High Country Conference leaders. The Trojans faced another challenging opponent Thursday, in Blackfoot.